Selective nerve injection is the same as a selective nerve root block. Remember that an epidural steroid injection is like hunting with a shotgun, and the purpose is to simply get you better by getting steroid in your spine.Well, a selective nerve injection is like hunting with a laser guided rifle. It is very diagnostic. Specific nerves are targeted using X-ray and the tip of a thin needle is steered next to the specific nerve. Very small amounts of medication, usually xylocaine and sometimes steroid are injected around the nerve. The big advantage of SNI is that it is very diagnostic. If pain is blocked by the very small amount of xylocaine around the nerve, then we know that is the nerve causing the pain. Sometimes steroid is also added to see if perhaps prolonged relief can’t be achieved at the same time. 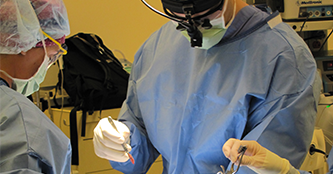 This procedure is done along all levels of the spine with or without sedation.